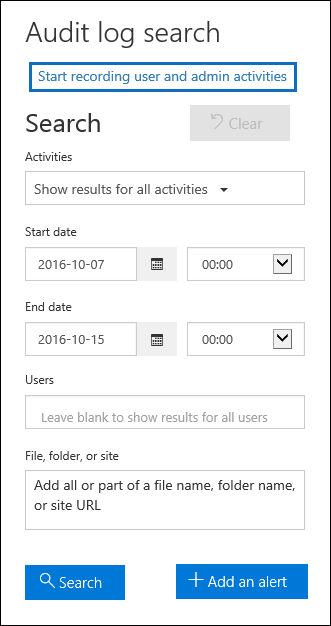 You (or another admin) must turn on audit logging before you can start searching the Office 365 audit log. When audit log search in the Security & Compliance Center is turned on, user and admin activity from your organization is recorded in the audit log and retained for 90 days. However, your organization might not want to record and retain audit log data. Or you might be using a third-party security information and event management (SIEM) application to access your auditing data. In those cases, a global admin can turn off audit log search in Office 365. You have to be assigned the Audit Logs role in Exchange Online to turn audit log search on or off in your Office 365 organization. By default, this role is assigned to the Compliance Management and Organization Management role groups on the Permissions page in the Exchange admin center. Global admins in Office 365 are members of the Organization Management role group in Exchange Online. Users have to be assigned permissions in Exchange Online to turn audit log search on or off. If you assign users the Audit Logs role on the Permissions page in the Security & Compliance Center, they won't be able to turn audit log search on or off. This is because the underlying cmdlet is an Exchange Online cmdlet. If you turn off audit log search in Office 365, you won't be able to use the Office 365 Management Activity API to access auditing data for your organization. Turning off audit log search by following the steps in this article means that no results will be returned when you search the audit log using the Security & Compliance Center or when you run the Search-UnifiedAuditLog cmdlet in Exchange Online PowerShell. This also means that your audit logs won't be available through the Office 365 Management Activity API. For step-by-step instructions on searching the Office 365 audit log, see Search the audit log in the Security & Compliance Center. You can use the Security & Compliance Center or PowerShell to turn on audit log search in Office 365. It might take several hours after you turn on audit log search before you can return results when you search the audit log. You have to be assigned the Audit Logs role in Exchange Online to turn on audit log search. In the Security & Compliance Center, go to Search > Audit log search. Click Start recording user and admin activities. 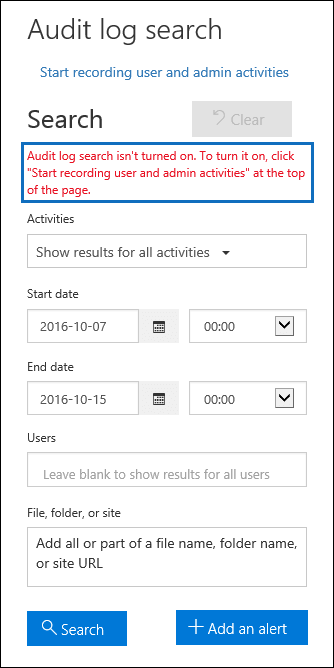 A dialog box is displayed saying that user and admin activity in your organization will be recorded to the Office 365 audit log and available to view in a report. A message is displayed that says the audit log is being prepared and that you can run a search in a couple of hours after the preparation is complete. Run the following PowerShell command to turn on audit log search in Office 365. A message is displayed saying that it might take up to 60 minutes for the change to take effect. You have to use remote PowerShell connected to your Exchange Online organization to turn off audit log search. Similar to turning on audit log search, you have to be assigned the Audit Logs role in Exchange Online to turn off audit log search. Run the following PowerShell command to turn off audit log search in Office 365. The value of False for the UnifiedAuditLogIngestionEnabled property indicates that audit log search is turned off. In the Security & Compliance Center, go to Search > Audit log search, and then click Search. A message is displayed saying that audit log search isn't turned on.